Palestine will be a bigger issue in this election than ever before. In the week preceding the October 13 House of Commons vote on the recognition of Palestine, 57,808 emails were sent to MPs from the PSC website alone. In some constituencies MPs received over 1,500 emails from their constituents. For more and more voters it is essential to know candidates’ views on Palestine before deciding whether to vote for them. For all candidates and MPs it is essential to know how to answer questions on the Israel-Palestine conflict. Here we list the seven questions sent to every candidate by the Palestine Solidarity Campaign and our suggested answers, but there are many more questions being and individuals asking questions of candidates at hustings and candidates’ round-tables up and down the country. The Israel advocacy organisation ‘We Believe in Israel’ has also circulated suggested answers. We include a response to their argumentation. Long answers are not required to an emailed questionnaire. One word will do if it’s the right one! But longer answers may be necessary at hustings. It’s very helpful if you cc info@palestinebriefing.org in emails to or from MPs. Question 1: I urge the UK Government to uphold the principles of equality, human rights and international law in all its relations and dealings with Israel. Denying human rights to Palestinians with Israeli citizenship (at least 50 Israeli laws discriminate against Israel’s Arab minority according to the civil rights organisation Adalah). Far from being a model democracy, Israeli comes 44th in the 2014 Index of Economic Freedom behind Macedonia, Latvia, Armenia and Jordan, 96th in the 2014 World Press Freedom Index below Kuwait, Liberia, Mongolia and Panama and bottom in an international Freedom of Religion Index scoring zero along with Iran, Saudi Arabia, China and Afghanistan. What we say: Their only answer on this question is to point to human rights violations by Hamas and by the Palestine Authority. No one would deny that there have been human rights violations under Hamas in Gaza and to a lesser extent under the PA in the West Bank. We condemn all violations. But it is significant that ‘We Believe in Israel’ tries to shift the focus rather than trying to deny it is guilty of human rights abuses and breaches of international law. Question 2: I consider the construction of Israeli settlements on occupied Palestinian land in the West Bank and East Jerusalem to be illegal and unjustifiable. Points to make: International law on military occupation is contained in the Fourth Geneva Convention (which Israel has signed). It says an occupier “may not .. transfer parts of its own civilian population into occupied territory”. There is no room for doubt. The UK government repeatedly points out to Israel that settlements are illegal. Every country other than Israel says considers them illegal (although the US prefers the word “illegitimate”). On top of that at least a third of settlements are built on privately-owned Palestinian land which has been expropriated. The Fourth Geneva Convention allows the requisitioning of private land only for military purposes and it must be returned to its owners once it is no longer needed for military purposes. Handing over requisitioned land to Jewish-only settlements is both illegal and discriminatory. What we say: International law is not complex. It is clear. Israel refers to them as “disputed” territories, but they are disputed only by Israel. Everyone else calls them “occupied”. The PLO has always accepted there will need to be negotiations before a settlement, but what is already laid down in international law cannot be “negotiated”. It’s true that Israel withdrew from their settlements in Gaza in 2005 (destroying them as they went) but only 1-2% of Israel’s settlements were in Gaza. 98% were in the West Bank. Many of the settlers transferred straight from Gaza into West Bank settlements. In the year of their withdrawal from Gaza the number of settlements went up not down, and it has gone up every year since. It is now 650,000. Question 3: Do you agree that one of the first acts of the next UK Government should be the recognition of Palestine? Points to make: Palestinians were promised statehood in 1949 and the promise has been repeated many times in the last 60 years. William Hague said Palestine was ready for statehood in 2011 and the World Bank, the IMF and the EU all agreed that its institutions were ready for statehood. But Hague told the Commons he would only recognise Palestinian “at a moment of our choosing and when it can best help bring about peace”. Most people thought that moment arrived when the Kerry talks collapsed in April 2014, but the UK dithered. Parliament voted 274-12 in favour of recognition and there have been similar votes in the Irish, French, Spanish, Portuguese, Danish and European parliaments. 135 countries have now recognised Palestine. Ed Miliband has said a Labour government will recognise Palestine. What ‘We Believe in Israel’ says: I believe that a Palestinian state … should come about as an outcome of a peace settlement. What we say: Saying recognition must wait until a peace settlement is signed is handing the Israelis a veto. Many believe the undeclared Israeli aim is to spin peace talks out indefinitely so they never need to recognise a Palestinian state and so they can gradually absorb the West Bank into Israel. While there must be negotiations over the details of a peace settlement, the question of whether the UK government should confer diplomatic recognition on Palestine is a decision for the UK alone and should not be subject to an Israeli veto. Similarly the question of whether Palestine should be recognised as a state is an issue for the UN and the whole world and not for Israel. Question 4: Do you agree that the blockade on Gaza should be lifted immediately? Points to make: The economic blockade of Gaza is a collective punishment. It is punishing 1.8 million people for the actions of Hamas and other militant groups. In international law a collective punishment is a war crime, in moral terms it is a form of hostage-taking and in political terms it is counter-productive. It is more likely to strengthen resistance than to weaken it. Although the ban on importing goods that have a possible military use is justified as a security measure, the ban on exports has no plausible security justification. It leaves factories idle and most Gazans dependent on food aid. The ban on import of construction materials causes huge hardship (the 100,000 made homeless by the war are still homeless). And the restrictions on humanitarian aid (running at half the pre-blockade levels) are part of a deliberate policy of ‘semi-starvation’ as comments from senior Israeli sources have confirmed. What ‘We Believe in Israel’ says: An immediate lifting of the blockade would have the effect of giving Hamas carte blanche to rearm and renew the conflict. What we say: It is inhumane to continue to support an economic blockade which is causing poverty, hardship, hunger and suffering to 1.8 million people. It’s true that some building materials can be used for military purposes, but this is a vicious circle. Of course the Gazans will want to build up their defences if they are constantly attacked by the Israelis. Isn’t this exactly what Israel does? On the other hand the West Bank is demilitarised. The Palestine Liberation Organisation renounced violence in 1988 and adopted a policy of non-violent resistance backed by international pressure on Israel and the Palestine Authority enforces a strict ban on arms in the areas in controls. What has been their reward? The Israelis have stolen their land to build settlements, ransacked and demolished their homes, turned a blind eye to settler violence and killed hundreds of Palestinians. If Israel wants Gaza to become demilitarised, the first step must be to show that an unarmed Palestinian state can live safely and securely next to Israel. Question 5: Do you agree that we should stop trade with Israel’s settlements on Palestinian land, and stop settlement goods being sold in Britain? Points to make: The EU is the biggest donor to the Palestine Authority, funding projects to protect Palestinians from Israeli settlements. Yet the EU helps to keep those settlements in business by importing goods from settlements worth £198 million a year. What ‘We Believe in Israel’ says: Palestinian workers in Israeli enterprises [in the settlements] enjoy terms and conditions far better than most other Palestinians. What we say: This is the classic argument used during South African apartheid to justify the exploitation of black workers. The World Bank estimates that the Israeli occupation costs the Palestinian economy $3.4 billion a year. If Palestinian businesses were allowed to develop, Palestinians would be 35% richer. Furthermore the Israeli settlements take 80% of the water and 100% of mineral deposits in the West Bank and the Dead Sea which belong to Palestine. This is worth far more than a few jobs in Israeli-owned factories in illegal settlements. Question 6: Do you agree that the EU Israel Association Agreement (giving tariff reductions to Israeli goods) should be suspended until Israel meets its human rights obligations? Points to make: Under Article 1 of the EU-Israel Association Agreement Israel enjoys privileged duty-free access to the EU market, worth an estimated £750 million a year, while third world countries have to pay tariffs ranging up to 85% before they can sell goods in Europe. The agreements Israel enjoys with Europe outstrip those offered to any other non-European state, even Turkey. But under Article 2 of the agreement these tariff reductions are dependent on “respect for human rights and democratic principles” which are, it says, “an essential element” of the agreement. The EU condemns Israel’s breaches of international law (such as settlements, the wall, the Gaza blockade, the annexation of Jerusalem) which undermine democratic principles and the human rights of Palestinians, yet it fails to enforce Article 2 of the EU-Israeli Association Agreement to suspend the agreement until Israel is in compliance. Under a similar association agreement with Ukraine, it took only a few weeks for the EU to impose a total ban on imports from Crimea. The European Union is Israel’s biggest trading partner accounting for 34% of Israel’s imports and 32% of its exports in 2013 but the EU depends on Israel for only 0.7% of its trade. The EU is therefore in a stronger position of influence over Israel than any other country, including the US. By suspending the agreement, it could put effective economic pressure on Israel. Question 7: Do you agree that the government should stop supplying arms and security equipment to Israel until it complies with international law? Points to make: UK policy is not to issue arms export licences for arms that “might be used for internal repression”. After the 2008-9 Gaza war David Miliband withdrew five licences. After the 2014 war more licences were reviewed. But the UK still has 131 arms export licences to Israel including components for drones and laser guidance systems for bombs. Past experience shows that undertakings not to use arms for internal repression are ignored. What ‘We Believe in Israel’ says: Israel is a democracy facing serious threats from heavily-armed terror groups including Hamas, Hezbollah, ISIS and Al-Qaeda. The idea that we would refuse to provide it with the arms it needs to defend itself is repugnant. What we say: Israel has the fourth strongest armed forces in the world, thanks partly to US support but Israel also has a massive arms industry of its own. The idea that Israel would be in danger if the UK stopped selling them arms because they are “facing serious threats from heavily-armed terror groups like Hamas” is laughable. Israel has the most sophisticated missiles and anti-missile systems in the world, while Hamas rockets are rudimentary home-made and lack any effective guidance systems. Israel uses the fact that its arms are “field-tested” (ie tested in live warfare) to market its arms exports; the UK should guard against complicity with Israel’s arms-export industry. It may take a week or two before the new government of Israel is formed, but it is clear that Netanyahu will still be Prime Minister and it will be a Likud-dominated coalition. Netanyahu made it clear during the campaign that he now opposes a Palestinian state so the new government will not even nominally support the two-state solution. Whether Netanyahu changed his mind or whether he only pretended to support the two-state solution in the first place, the fact is that the international community will be at odds with the new Israeli government on this fundamental issue and there will no longer be any point in pursuing diplomatic initiatives that are bound to fail. Only those who do not really want a solution will continue to pursue unconditional negotiations. The solution is not hard to find. It is the same solution that is being used by the international community in every other case where a state defying international law. It involves economic pressure. In the case of Israel there is an even simpler step that can be taken and one that is already overwhelmingly supported by the House of Commons. That is to grant bilateral diplomatic recognition to the state of Palestine. “Recognise the state of Palestine now. It is the only way to safeguard the two-state solution to the long-term benefit of Israelis and Palestinians – and to uphold our own values and our own interest. “Recognition of Palestine on 1967 lines is the logical step now for all states committed to an equitable two-state solution. showing to the world and to ourselves that right matters more than might. Lisa Nandy (Wigan) (Lab): What assessment she has made of the humanitarian effects of the blockade of Gaza. Guy Opperman (Hexham) (Con): What assessment she has made of the effectiveness of the efforts made by the (a) UN and (b) UK to improve the humanitarian situation in Gaza. Minister of State Mr Desmond Swayne: Movement restrictions damage the Gazan economy, with the result that 80% of Gazans are dependent on aid, 57% are dependent on food aid and 43% are unemployed. Most of the UK contribution to the relief effort is delivered through the United Nations Relief and Works Agency, and I judge that to be effective within the limitations of the funding and the movement restrictions. Lisa Nandy: As winter approaches, the Minister will know that the humanitarian situation in Gaza remains dire. It is welcome that the UK has pledged £20 million to help, but what is his Government’s long-term plan, given the re-election this morning of the Prime Minister who believes that the continuation of the blockade of Gaza is a good thing; believes in the building of illegal settlements; has abandoned a two-state solution; and believes that the deaths of more than 2,000 people in Gaza last summer were “proportionate”? Surely now is the time for the Minister to put pressure on his ministerial colleagues, recognise the state of Palestine and end this appalling situation. Mr Swayne: The Member is right in that the state of affairs in Gaza is desperate. However, on the recent events and the election, I am tempted to call in aid the wisdom of the Ents and say that we should not be hasty. It will be some time before the true policies of the new Government emerge, after long negotiations over a coalition. In the meantime, we remain committed to the two-state solution and we make our representations known on all the issues that she has raised, at the highest level. Guy Opperman: What specific assessment has been made of the Gaza reconstruction mechanism? How many people have been accessing the building materials? Mr Swayne: As of this morning, more than 60,000 individuals have had access to building materials, out of the in excess of 100,000 who need such materials. I am confident that the mechanism is working effectively, but clearly there will have to be a step change in movement and access which can result only from a lasting solution. Mr Andy Slaughter (Hammersmith) (Lab): Israel will have a Government opposed to a two-state solution and a Prime Minister who turned out his vote by an emergency broadcast that said: “Arab voters are heading to the polling stations in droves.” What is the international community going to do to get aid to Gaza, which is in occupation and under siege? How is the international community going to provide that aid when the occupation and siege are permanent? Mr Swayne: A great deal of aid for Gaza was pledged at the Cairo conference. We have delivered a quarter of our pledge, and within the first few weeks of the financial year we will have delivered all of the £20 million we pledged. We have been entering into a considerable diplomatic effort to get other countries that have made pledges to step up to deliver, and I am glad to say that Qatar and Kuwait have now done so. Michael Fabricant (Lichfield) (Con): The Minister will know that some 600,000 tonnes of concrete have been used for the construction of illegal tunnels for smuggling and to enable the firing of weapons into Israel. How can he ensure that aid gets to the people who need it and not to Hamas? Mr Swayne: One part of the Gaza reconstruction mechanism is the material monitoring unit, which my Department supports. It is designed specifically to do what my friend requests: to ensure that any materials supplied, stored and dispersed are for the proper purpose and that any infractions are reported. Grahame M. Morris (Easington) (Lab): The Minister says that we should wait and see what is going to happen in Israel, but now the mask has slipped and Netanyahu has said he will not allow a two-state solution and will not allow a Palestinian state. Is not the only solution that will relieve the suffering of the people in Gaza a concerted international action to lift the blockade? Mr Swayne: We continue to make representations at all levels about movement restrictions, but I repeat what I have said: we will have to wait and see what the new Government’s policy is, after they emerge from the coalition negotiations. Dr Julian Huppert (Cambridge) (LD): I share the concerns about the election results in Israel and what they mean for people in Gaza and elsewhere in that region. On a number of occasions Israel has had restrictions on parliamentarians being able to cross at the Erez checkpoint to see what is happening in Gaza. Will the Minister seek to get that changed so that people can see what is happening to the aid that we provide and to the people there? Mr Swayne: I am aware that, like me, the Opposition Front-Bench spokesman, the MP for Luton South (Gavin Shuker), was recently admitted to Gaza. Such visits do involve bureaucratic obfuscation, and we will continue to make representations in that regard. Debbie Abrahams (Oldham East and Saddleworth) (Lab): One of my excellent community groups in Saddleworth supports Palestinian women into education. Members of the group inform me that one of the education centres that they know well was recently ransacked by Israeli forces. The education centre is in Palestinian territory. Does the Minister agree that not only are these actions illegal, but they jeopardise future sustainable peace in the region? Justine Greening: Much of our work in the occupied Palestinian territories focuses on providing basic services, including education. At the Cairo conference one of the main concerns of donors was the need to end the perpetual cycle of violence, reconstruction, then destruction and violence and the need for more reconstruction. I agree with the Member that this cannot continue ad nauseam. “The European Union could promote a secure sea-route – and umbilical link – from Gaza to the EU via Cyprus with the agreement of the Israelis.” The Minister has lobbied EU foreign policy chief Federica Mogherini to push this. “The Israelis should unfreeze the payment of tax revenues” which they collect on the Palestinians’ behalf but are illegally refusing to hand over as punishment for going to the ICC, causing the non-payment of salaries for several months in the Palestine Authority. 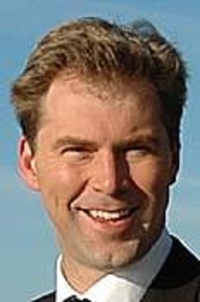 The debate was initiated by Michael McCann (East Kilbride) (Vice-chair of Labour Friends of Israel) who argued that the lifting of the economic blockade on Gaza had to be “utterly dependent” on the disarmament of the Gaza Strip. Richard Burden (Birmingham, Northfield) (Chair of the All-party Britain-Palestine group) said he could not go along with the idea that one could justify or excuse the situation facing the ordinary people of Gaza because Hamas “commits some heinous crimes – and it does”. Mark Durkan (Foyle) (SDLP) also said that the suggestion that Hamas would disarm in return for economic development “would make a hostage of all those peace-loving people in the Palestinian population who neither hold arms nor hold any brief for those who hold arms”. Israeli Arabs in the Negev were dismayed last week when the threatened demolition of their village was described in the Commons as a “planning matter”. “It is a planning matter that we have raised concerns about, “ Middle East Minister Toby Ellwood said at Foreign Office questions. The Israeli government plans to demolish the entire village of Um Al Hiran so they can build a Jewish village on the same site – possibly as early as next Monday, the day of the Israeli elections. The minister drew a distinction between the demolition of Bedouin villlages in the West Bank which was “contrary to international law” and the demolition of villages inside Israel like Um Al Hiran which was “a different matter”. MPs including Jim Cunningham (Lab), Andy Slaughter (Lab) and Sir Bob Russell (LD) urged him to ask the Israelis to raise the matter before the end of this week. A court in the Israeli city of Beersheba agreed that the demolition and eviction orders on 500 villagers can go ahead from March 17th. Village leaders have said that the Israeli settlers are welcome to move to a nearby site and live with them as neighbours, as there is plenty of land in the Negev. Jim Cunningham MP asked the minister to urge Israel to drop the demolitions and instead let the two villages co-exist side by side in the spirit of peace. He pointed out the Israeli government often tries to justify the demolition of Arab villages by saying the land is needed for an army firing range or a forest or a road – which are deliberately located so that Arab villages will need to be demolished. MPs who voted for the motion to recognise Palestine are shown in blue-green, those who did not vote are shown in brown and ministers who were under instructions not to vote in black. Five Palestinian student leaders flew to London to show their appreciation for Members of the UK Parliament who voted in favour of recognising the state of Palestine in a debate in the House of Commons. Commons on Tuesday February 24th. Abuamira, Makram Daraghma, Tareq Eshnino and Abd-Alrahman Barghouthi, brought a letter of thanks to the MPs from the Palestinian prime minister Rami Hamdallah. Makram Daraghma, who is the Prime Minister’s youth adviser, spoke briefly at the presentation and Tareq Eshnino, who is from Gaza, updated the MPs on the latest situation in the war-battered enclave. The presentation was organised by the General Union of Palestinian Students which represents hundreds of students from the West Bank and Gaza studying at British universities. The union’s Secretary-General, Fouad Shaath, told the MPs: “I don’t know whether MPs have any idea just how much encouragement this vote gave to Palestinians. We often feel close to despair – but this vote gave us hope. 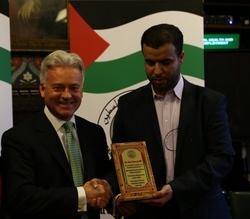 “The vote was supported by MPs of every party in Britain and it was welcomed by supporters of every party in Palestine. The Palestinian students’ union has members in universities across the UK and will be pressing all parties, all MPs and all candidates to declare their support for the recognition of Palestine in the coming election campaign. The House of Commons voted last October in a backbenchers’ debate on a motion “that this House believes that the Government should recognise the state of Palestine alongside the state of Israel. The result was 274 in favour and 12 against. The MPs who were presented with commemorative plaques was also cross-party, including 11 Conservatives, six Liberal Democrats and 27 Labour MPs. Six were former ministers in the present government and six were Opposition front-benchers or former ministers. They included Rushanara Ali, Dave Anderson, Gordon Banks, Anne Begg, Clive Betts, Richard Burden, Sarah Champion, Katy Clark, Michael Connarty, Jeremy Corbyn, Margaret Curran, John Denham, Frank Doran, Rt Hon Alan Duncan, Sir Edward Garnier QC, Rt Hon Cheryl Gillan, Mike Hancock CBE, Nick Harvey, Philip Hollobone, Jim Hood, David Jones, Sir Gerald Kaufman, Barbara Keeley, Mark Lazarowicz, Karen Lumley, Fiona Mactaggart, Anne Main, Andy McDonald, John McDonnell, Jim McGovern, Ann McKechin, Grahame Morris, Eric Ollerenshaw, John Pugh, Hugh Robertson, Bob Russell, Anas Sarwar, Alison Seabeck, Andy Slaughter, Andrew Stephenson, Andrew Stunell, Valerie Vaz, David Ward and James Wharton.